Have you heard of Olive Morris? I’m ashamed to say I hadn’t heard of Olive Morris until today although I’m not surprised because that kind of ignorance is why I started this blog in the first place. I came across Olive’s story today when someone I follow on Twitter posted about a seminal book called ‘The heart of the race:Black women’s lives in Britain’ which is 30 years old today. This book was published when I was nine-years-old and I think it is a sad indictment of the UK school system that I had not even heard about until now. I’m not going to pretend I know much about it but the introduction to the book states: “this book originally came about as a response to gaps in the historical record, especially concerning Black women. “Histories were being produced about Black struggles as a whole, but too often Black women’s roles and experiences were left out or diminished. The white-dominated women’s movements in the UK were also repeating the same thing: documenting ‘herstory’ from every angle except our own”. I find it really moving that in 1985 there were people who recognised that the story of how Black people (especially, in this case, women) have and are contributing to the UK was not being heard and wanted to address it. But it’s also a little bit sad that 30 years later IMO this topic has still not been properly addressed beyond a few committed and passionate individuals and organisations. Anyway, back to Olive Morris who was a leading voice in the Black women’s movement in the UK and spoke out on a range of social issues especially housing and education. Olive came to the UK from Jamaica when she was 9 years old and grew up in South London. During her teenage years she was involved in political activism and later co-founded several influential civil liberties groups including the Brixton Black Women’s Group and the Organisation of Women of African and Asian Descent. 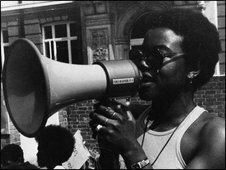 During the 1970s, which we all know was a turbulent time for Black people in the UK due to widespread racism and discrimination, Olive could be called on to mobilise and organise people and ensure their voices were heard. She was evidently a strong, committed and active woman who was determined to stand up for vulnerable people who may otherwise have been ignored by the system. Instead of sitting around, bemoaning the way things were, Olive set about trying to make them better and her courage in the face of what must have seemed daunting odds, is to be admired, even if you might not agree with all of her ideas or methods. People like Olive don’t come along often but when they do they shake up the establishment and show other individuals that we can all make a difference. Sadly, Olive died of non Hodgkin’s lymphoma in 1979 at the age of just 27, but I’ve often said you don’t have to live a long life to make an impact on the world and it’s clear that she certainly did from what I have been reading. I really think that learning about Black Caribbean people such as Olive, Claudia Jones, Walter Tull, should be compulsory in British schools. I certainly wish that I had known some of these stories when I was growing up – it may have helped me to realise just how much Black Caribbean people have added to the history of the country I was born in and so deserve to have their sacrifices remembered.